Daily swimming activities are structured to be safe, fun, and instructional. Pool time is supervised by certified life guards and staff. 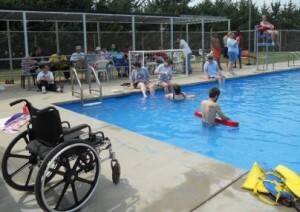 Counselors interact with campers to create spontaneous games in the pool. On the first time in the pool, everyone does a swim test to ascertain their skill level. If a camper’s swimming level is not where it should be for the deep end, they will wear a lifejacket and swim only in the shallow end. Camp has a stunning cove to swim in. Campers look forward to the opportunity to swim in the lake. 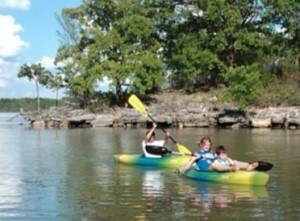 All campers and staff wear lifejackets while swimming in the lake. Lake swimming is always supervised by a certified lifeguard. J-Stroke, C-Stroke or Draw? Learn all of these types of paddle strokes and glide effortlessly across the water. Camp is a great place to learn life-long recreation skills. What a thrill to learn how to hit a bull’s-eye. Campers are taught the skills of target-shooting with bow and arrow. Through practice, persistence, safety and fun, archery builds confidence and self-control. Challenge yourself with our high and low ropes challenge courses. The course activities are designed to build confidence in one’s capabilities and strengthen a teamwork environment. Low ropes are part of the activities of most of our camps; high ropes are used mostly for adventure camps. Gathering around a campfire is one of the most memorable things we do at camp. We teach fire building methods, sing camp songs, do silly skits, roast marshmallows for s’mores, and even cook a meal or two. 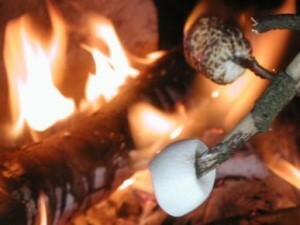 Come to an adventure camp and do lots of outdoor cooking. Yum! Crafts are an integral part of camp life, beginning with tie-dying your own t-shirt! Everyone looks forward to the delight of seeing what the dyes look like after they are done. There is also a craft choice on most days in the activity rotations. With 165 acres of lakefront property, this is a beautiful place to hike. There are lots of established trails through woods, over wooden bridges, and through prairie grass. Its lots of fun to explore and catch camp’s gorgeous views. We’ve also been known to take night hikes with flashlights. It’s amazing what you can see, hear and experience in the dark! From yard games like gaga, ladder golf, tetherball, sand volleyball, Frisbee golf, four square and others — to exciting night games like The Grog (played indoors) and Alpha Wolf (played outdoors), campers love our games. Camp’s pontoon boat takes campers (in lifejackets, of course) out on the lake to see more of our surroundings. Camp is established on a large peninsula in the center of Council Grove Lake. We have lake surrounding three sides of camp. We also go tubing when the weather and lake conditions permit. This activity, and all our water activities, is supervised by certified lifeguards. Located on the side of a hill with a great view of the lake is the labyrinth. Walking the circular path lined by the natural stones of a labyrinth is a peaceful time to relax and ponder. Every evening, depending on the weather, we gather to watch the sunset at Vesper Point. It’s a time for spiritual songs, a bible message, sharing and connecting to God. This is the first place former campers come to when they visit camp. It becomes one of the most meaningful aspects of camp for all. Camp songs are like no other! We sing grace before every meal, we sing after meals, and we do fun “repeat-after-me” songs at campfires. Lots of smiles, laughter and bonding are created with songs. Another fun aspect of camp is creating skits with the counselors. We really enjoy the creative things they come up with!